My husband and I sell energy-efficient stoves in order to provide a better future for our seven children. With your support, I'll be able to access a loan and start my own bank account. 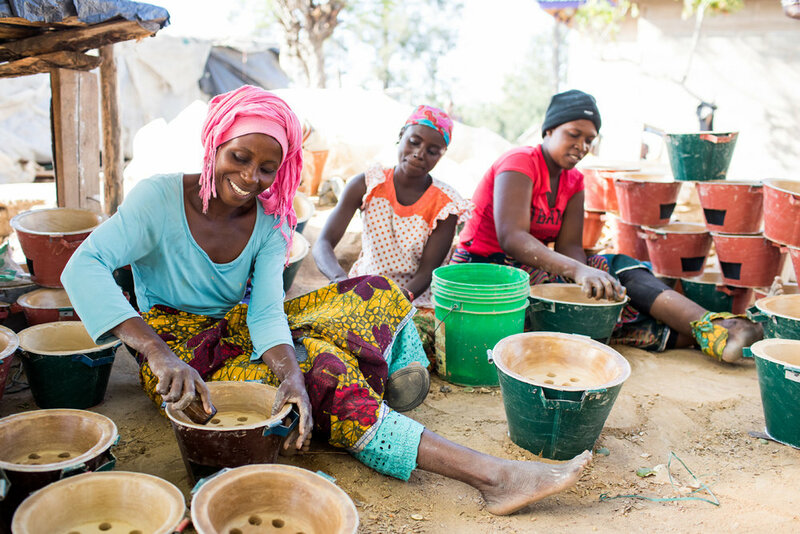 Help Agnes become a thriving stove entrepreneur in her community. To sponsor Agnes, give $200 per month for her two year training program. You will receive four updates on Agnes, as her business grows. After two years, your monthly gift will end. Agnes began selling energy-efficient stoves in 2003. Since then, her business has changed her life. She's earned enough to pay for basic needs, and she met her husband, Amos! "We met in this business. I was digging the clay, and he was making the metal clads." Now, Agnes and Amos work together to grow their business and provide for their family. Why she was selected for the program: Agnes is a capable entrepreneur, determined to build a better life for her family. "I like making cookstoves because the income helps me with household needs and paying school fees for my children." Her business goal: Within the next six months, Agnes hopes to access a loan to help grow her business. "I want to get capital to scale up my business and also get some equipment to help me in production and processing." She also hopes to get a bank account. "If someone helped me, I would be proud to have a bank account, to put the savings in there and deal with problems when they arise."